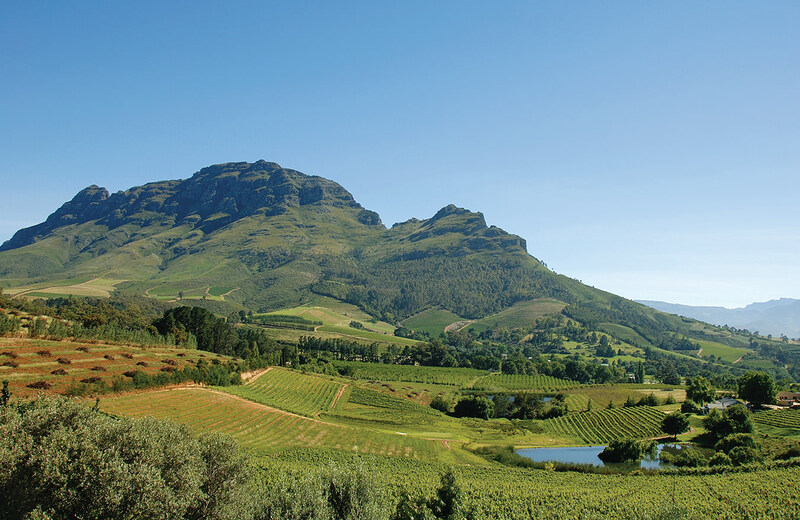 The Simonsberg Mountain forms the border between the Stellenbosch and Paarl wine regions in South Africa. The South African wine industry did not have the most impressive of beginnings. Grapes were first planted in the (then-Dutch) Cape Colony in the mid-1600s, but not because the region was thought to have excellent prospects for producing quality wine. Rather, wine was made there because Dutch ships en route to the East Indies via the Cape needed to stock up on alcohol, a much safer alternative to the poor-quality water that sailors were forced to drink after months at sea. Made with alcohol, not pleasure, in mind, this early wine was, from many accounts, pretty dire stuff. In the past two decades, South Africa’s wineries have played catch-up, and done so very successfully. Vineyards have been renovated (and expanded by more than 50 per cent), best international practices adopted, and winemaking modernized. Ethical processes have become core to the industry, to an extent unmatched elsewhere. There are more fair-trade wines in South Africa than any other country, and many wineries have “fair labour practices” certification. Almost all South African wineries are now certified as sustainable, which includes promoting biodiversity, and more than half the wine-producing land has been maintained as natural habitat. There’s now greater diversity around the vineyards, as fynbos (native shrubland) has been restored and indigenous birds, otters, leopards, and other animals have returned. There’s also more diversity in the vineyards themselves. When South Africa re-entered the international wine market in the early 1990s, it was mainly with the country’s signature grapes: chenin blanc and pinotage. But chenin was not in the style that consumers in North America and Europe were looking for, and pinotage too often delivered flavours often described as a little too similar to burning rubber. Chenin blanc and pinotage are still the most important varieties in South Africa. Chenin blancs are generally fruitier than the corresponding styles from the variety’s home in France’s Loire Valley. Some are big, luscious numbers, like Weltevrede Chenin Blanc 2012, which is rich and quite pungent in flavour, with a clean, fresh texture. Others, such as Intellego Chenin Blanc 2011, are leaner and more linear in style, with crisp acidity. 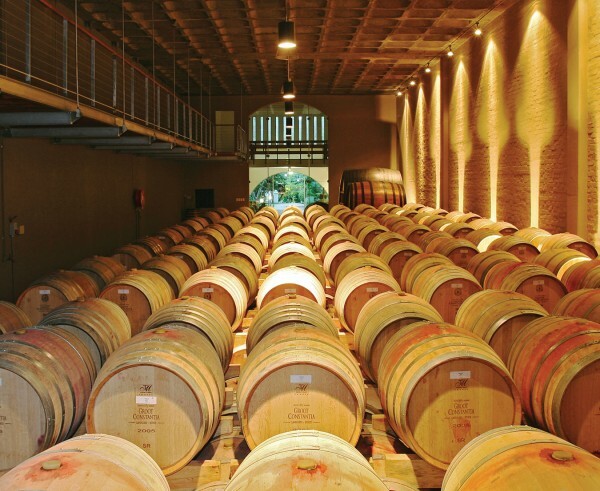 The cellar at Groot Constantia Estate. As for pinotage, a key producer is Kanonkop, in the Stellenbosch region. The 2010 vintage is fruit-forward, with intense flavours moderated by clean acidity and a tannic grip that promises longevity. The back labels on Kanonkop pinotages feature timeline graphs that indicate when the wine is ready for drinking, and they suggest these pinotages will hold on a long time. The promise is borne out by the 1994 vintage, tasted nearly 20 years later and still going strong, with astonishingly fresh fruit, good acidity, and fairly firm tannins. A recent innovation in the world of pinotage is a style that brings out espresso coffee flavours. With brands like the Grinder and Café Culture, they have become popular mass-market wines, and they have the potential to either revive international interest in pinotage or dispatch the variety to a caffeinated ghetto. Beyond chenin blanc and pinotage, grapes like sauvignon blanc, chardonnay, cabernet sauvignon, and syrah/shiraz have rapidly increased their representation in South Africa’s vineyards. South African shiraz can give Australia’s a run for its money in terms of quality, while sauvignon blancs from South Africa’s cool-climate areas deliver a style midway between the restraint of Sancerre in France and the pungency of Marlborough in New Zealand. J. C. Bekker, group winemaker at Boschendal winery, says that in his opinion, “shiraz is the best variety suited to South Africa.” Each vintage of Boschendal’s 1685 series of shirazes shows a compelling style animating the rich fruit flavours, while its Cecil John Reserve Shiraz 2010 displays real elegance. Temperature is an important consideration in South Africa’s wine regions. Most are warm and produce the rich wines, fairly high in alcohol, commonly thought of as the New World style; however, there has been a drive to find cool-climate regions or cooler areas in warm regions, particularly as climate change and water shortages take hold. Notably cooler regions include Elgin, a high-altitude area to the east of Cape Town, where riesling, sauvignon blanc, and pinot noir thrive in the long, cool growing season. And on the south coast, there’s Elim, one of South Africa’s newest wine regions. It’s cooled by southern breezes from the ocean that separates South Africa from Antarctica, and the climate is right for sauvignon blanc, syrah, and pinot noir. In the past two decades, South Africa’s wineries have played catch-up, and done so very successfully. Ethical processes are core to the industry, to an extent unmatched elsewhere. At Avondale, an organic winery in Paarl, one non-artificial pesticide is a hundred-strong posse of glossy white Pekin ducks, which are employed to eat the snails that are often harmful to the vines. The ducks live off-site, and are brought to the vineyards each day in a “duck-mobile”—a specially designed cart pulled by a tractor. At Waterkloof, which is farmed according to biodynamic principles, the pesticides of choice are chickens, which eat the mealy bugs that attack the vines. For plowing, Waterkloof employs seven horses, which work at about the same speed (3.8 versus 4 kilometres an hour) as tractors. They seem to do it right most of the time. Waterkloof’s Circle of Life Syrah 2012 shows well-balanced ripe fruit right through the palate, with grippy tannins, the same style is evident in its merlot sibling. The whites are as impressive, with the 2012 Peacock Ridge Chenin Blanc a study in luscious flavours and fine balance. In the warm Swartland region, the historic source of many full-bodied, weighty reds, a number of producers have banded together as the Swartland Independent Producers with the aim of promoting the regional character of their wines. Each year in November they hold an annual festival: the Swartland Revolution. Members of the group include Mullineux Family Wines, whose 2010 cinsault is big and full flavoured, but shows excellent structure and balance; Kloovenburg, whose 2010 Eight Feet shiraz-cabernet blend (its name a reference to the four boys who stomped the grapes) is both full of ripe-sweet fruit and finely balanced; and Lammershoek, which makes a hearty and well-calibrated syrah from the same vintage. South Africa is one of the most biodiverse places in the world: its mere 1 per cent of the Earth’s land surface has almost 10 per cent of the world’s total known bird, fish, and plant species, and over 6 per cent of the mammal and reptile species. The wine picture—in styles, varieties, general environmental and social practices—is also diverse, and it is likely to diversify even more as new sites are planted and new methods are adopted. South Africa’s wine producers have had to overcome political, social, and environmental obstacles to achieve their successes, and it has given them a collective ethic of innovation that contrasts starkly with winemaking cultures that stress tradition.